The buildings she visited include two postwar-modernist style buildings from 1970s. Dallas city hall by architect I.M. Pei completed in 1978 and Kimbell art museum by architect Louis I Kahn completed in 1972. However, there was an addition later made to the Kimbell art museum by architect Renzo Piano in 2013. The more recent buildings visited consists of the Perot museum of nature and science by architect Thom Mayne built in 2012 and The modern art museum at Fort Worth by architect Tadao Ando finished in 2002. Some of these enlisted architects are the 'Pritzker Prize' winners which is one of the most prestigious awards in the field of architecture. 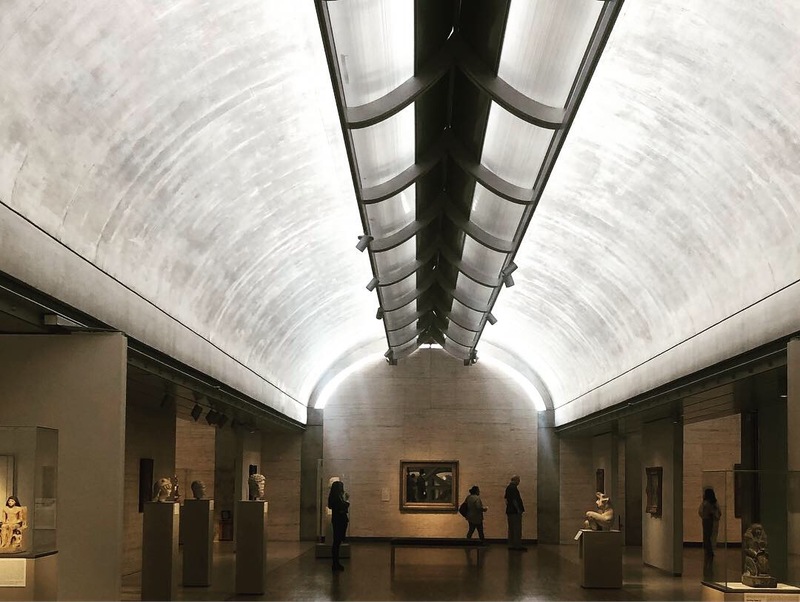 Kimbell art museum- Original building with extensive vaults and metal framing. Completed in 1972 by architect Louis I Kahn. Perot museum of nature and science- Completed in 2012 in Dallas, Texas by architect Laureate Thom Mayne. Perot museum of nature and science- Rear side of the building showing a skyline of the city of Dallas as a backdrop. The Dallas city hall- Administrative government building in Dallas downtown. The Building has a serene foreground with a waterbody and landscaping which enables to take-in and balance the huge proportions of the building scale. This geometry dominant building is designed by architect I.M. Pei. The modern art museum, Fort Worth- This minimalist styled building is designed by architect Tadao Ando. An extensive use of glass establishes a seamless connection between the exterior and interior of this building making the spaces feel bright and spacious. Numerous areas like the foyer, cafe, and some art galleries allow a view to the calm waterbody in the background of the building. The modern art museum, Fort Worth- View of the exterior from the entrance foyer.